The parents have returned from their winter in Puerto Rico and that gives me a chance to make things that are a pain in the neck to do up for one adult, but seem like no work at all for a lavish spread for three grown-ups and a kid who likes couscous (especially seasoned with pesto) and asparagus. Plus, make loads and leftovers are guaranteed and you know I love that! 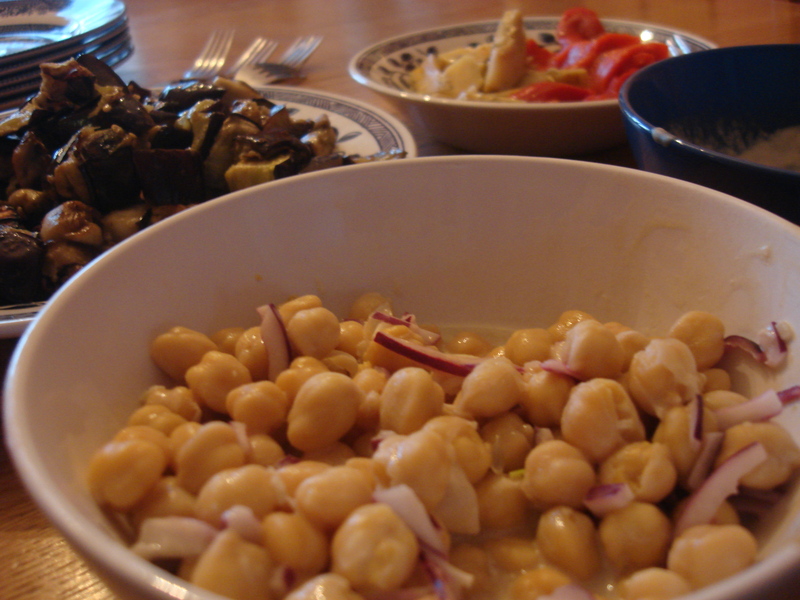 This sudden inspiration came straight from the pantry: jarred artichoke hearts and roasted red peppers, black olives, garbanzos from a can, that type of thing. From the fridge: feta, tomatoes, cukes, asparagus. How fun would it be to lay out mezze (Mediterranean small dishes) with a variety of salad ingredients and sit all together for a change? So I did and it was fun and crunchy and creamy and delicious. Roasted asparagus: Rinse and break off bottoms of a 1 lb. bunch of asparagus. (They break naturally at the woody part; or break off one and slice off the rest at around the same place) Smear with two teaspoons of olive oil and roast at 450 for 10 minutes (skinny spears) to 15 minutes (fat spears). Finish with flaky sea salt. 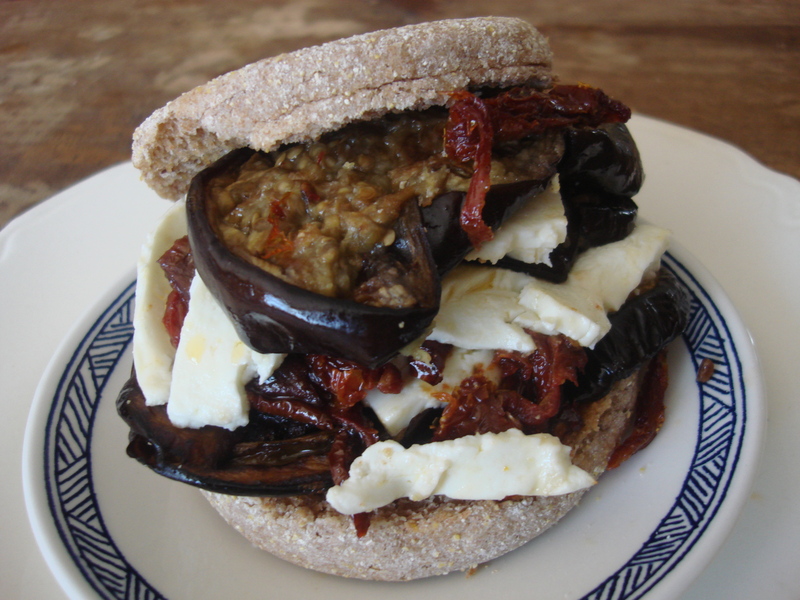 Roasted eggplant: Rinse and cut a large eggplant into one-inch chunks (for older eggplant that feels a bit soft to the touch, put in a colander and sprinkle with salt. Put a weighted bowl on top and another bowl to catch the drippings. Leave for a half hour and pat dry before the next step). Smear with a tablespoon or so of olive oil and roast at 450 for 15 minutes or until cooked through and soft, turning once with tongs. 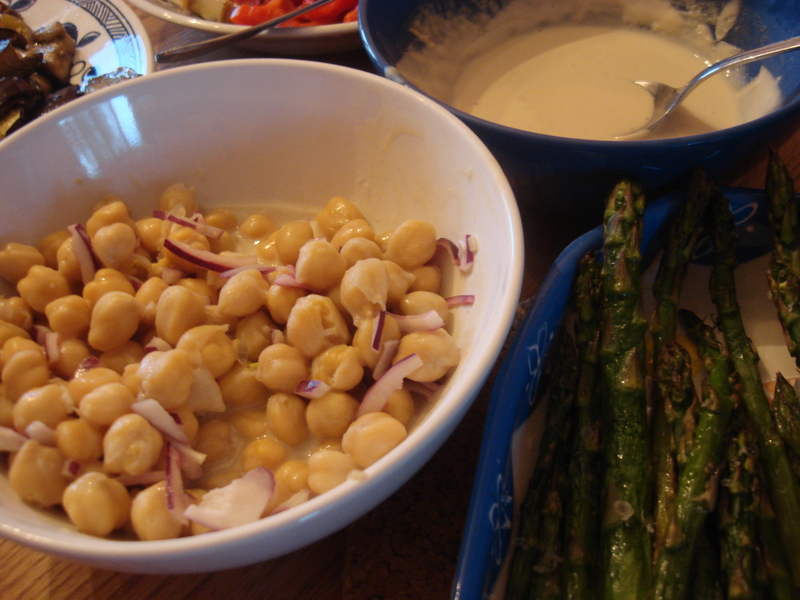 Garbanzos (chick peas) in tahini: Rinse and drain a 28 oz can of chick peas. Add a tablespoon chopped red onion. 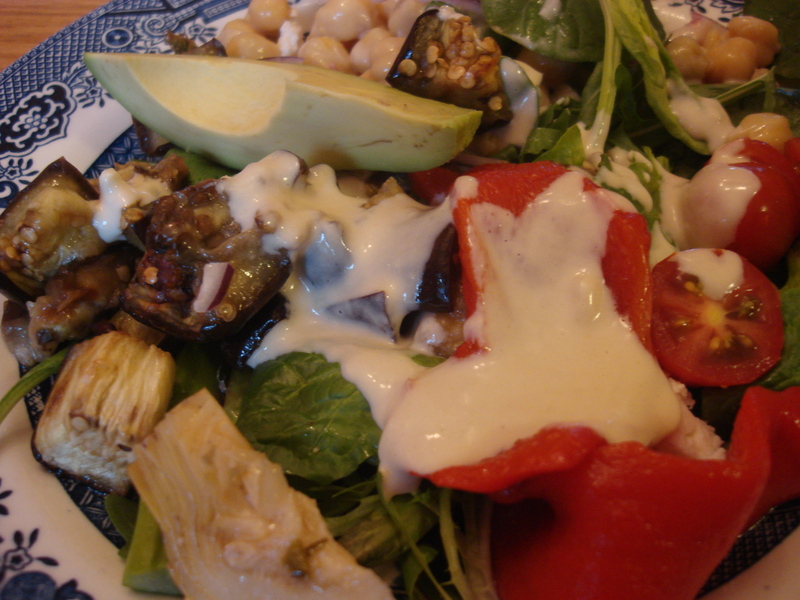 Add two or three tablespoons of tahini dressing (below) and serve. Mix all ingredients except water and salt in a bowl (deeper is better to avoid splashing) or mixing cup. Salt to taste and thin with water to desired consistency. Add chopped parsley if desired. Thin for use as salad dressing. Leave it thick to use as dip for vegetables. Leave it medium dense and creamy as a sauce sauce for falafel. Couscous with (prepared) pesto: prepare one half cup couscous (Israeli or fine) according to package directions. Add two tablespoons prepared basil pesto (or your favorite) and serve warm. 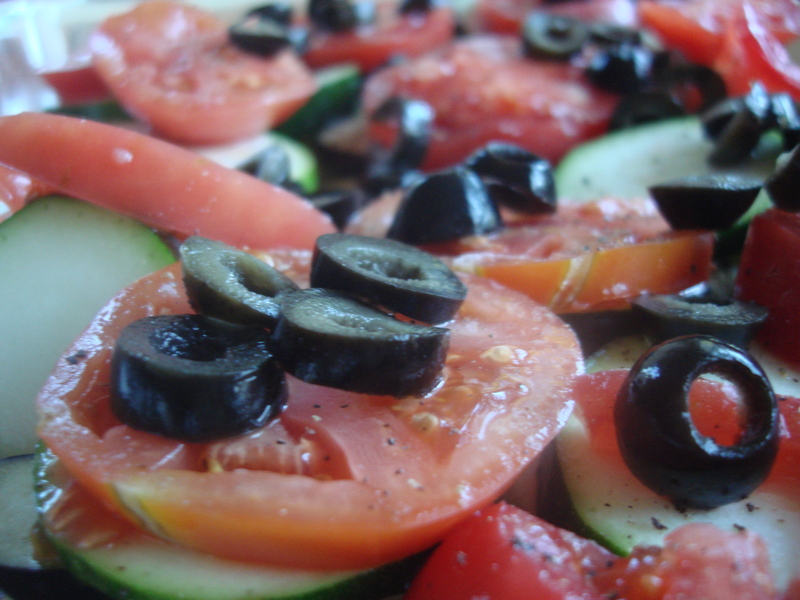 Additional stuff: chunks of feta, black olives, halved or quartered cherry or grape tomatoes, cucumber slices, avocado and mixed greens, as desired. Try hard-boiled eggs. A drained and flaked can of tuna would be great too, with a bit of chopped onion if you are not into the vegetarian thing. 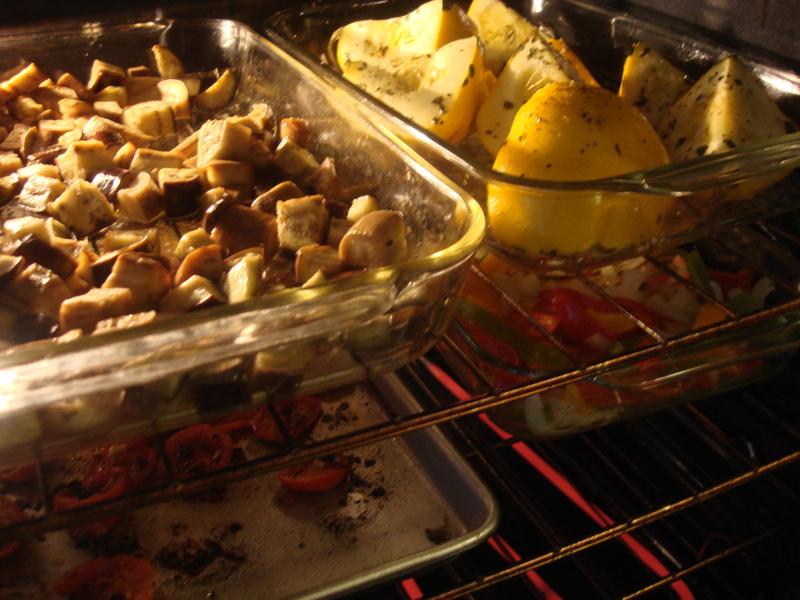 Here are the last two recipes for my oven-packing roasting-mania session that resulted in a couple of days’ worth of meals as I used the vegetables in several different ways. 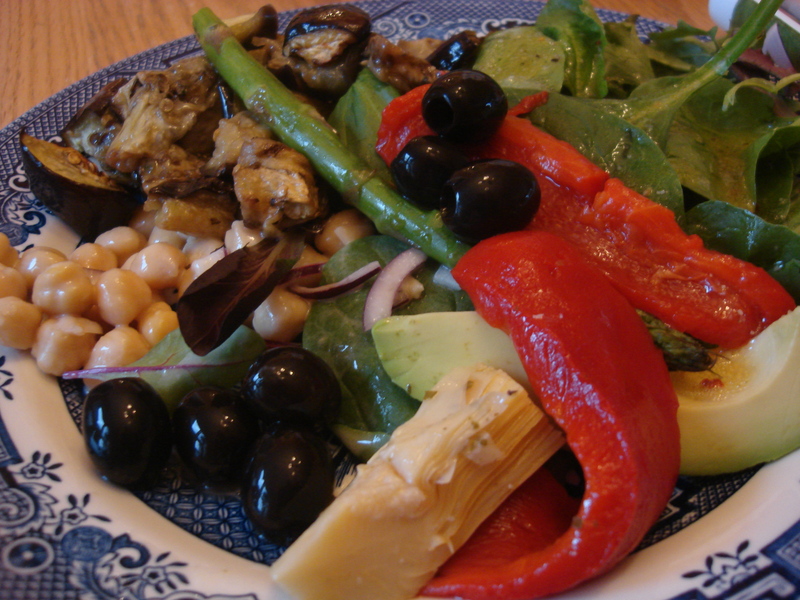 Vegetarians and vegans will enjoy the deeper flavor roasting gives to vegetables. Environmentally-conscious cooks will like the energy saving of packing the oven. 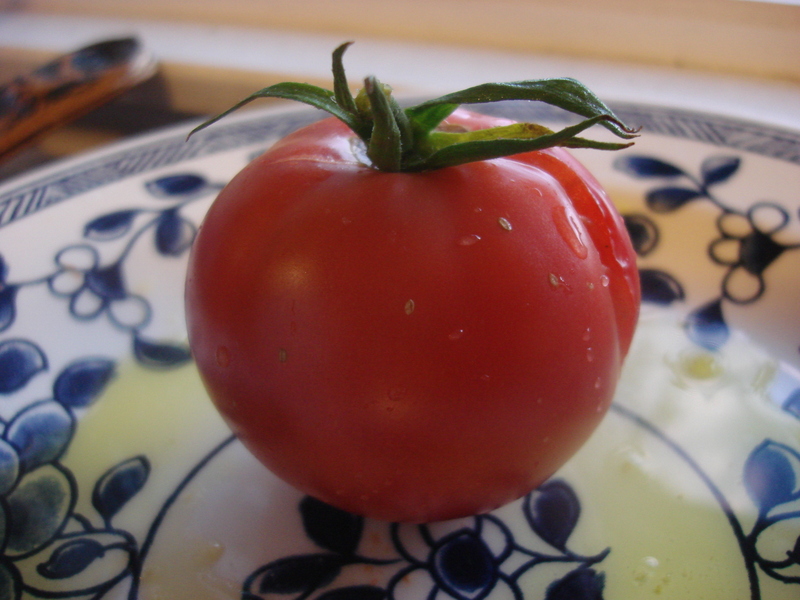 And busy folks will be very pleased; once the chopping is done, the time-consuming work is over! These are not really recipes on their own, but something great to have on hand to assemble quick meals. They also extend the life of vegetables you have too many of but don’t want to lose! These two were especially good in my take-to-work wrap. I just slapped some hummus on a wrap, laid out some roasted vegetables, a few strips of sundried tomatoes and some of the roasted tomatoes I told you about a couple of days ago. Delicious!